Are Virgin Media's new Usain Bolt adverts a mere coincidence or Olympic ambush marketing? "We are obliged to prevent other companies undertaking unauthorised activities that undermine or devalue the exclusive rights we offer our sponsors and licensees." By looking at these official statements about brand protection and ambush marketing it is clear that LOCOG is out to protect the multi-million pound image created and also to crack down on any potential advertising threats. By digging around the news and also official documentation it is evident that LOCOG hasn't currently taken any action against Virgin Media for this set of advertisements, but why is this? Virgin Money Giving's office, by HowardLake on Flickr. 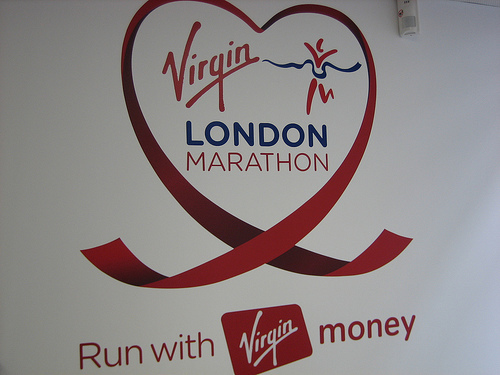 It's interesting to look at this situation by focusing of the athletic star Usain Bolt and also many other track athletes as Virgin were the official sponsor of the recent London Marathon that many talented athletes took part in. Could it be that Usain Bolt and other track athletes are too important to the Games that LOCOG wouldn't want to challenge this particular marketing campaign purely to protect the athletes and a maintain a positive out look on the Games as a whole? "In order for Virgin Media to really capitalise on the association depends on what they do with it over and up to the Games. If they deepen the association (maybe tie up with events, grass roots or other athletes), broaden it (customer engagement, loyalty, PR, experiential stunts, corporate hospitality, employee engagement etc) they have a real opportunity to steal the limelight and benefits of BT’s official Olympic association." So the question is, is this technically ambush marketing or just well timed endorsements and mere coincidence? See my advice about beginnings and endings (chop the first and probably last par). Watch out for unsupported statements such as "has impacted the sponsorship system" - link to evidence. And watch for clumsy language ("impacted" should be "had an impact on"), typos ("strageic"), and extra carriage returns.